8:30 pm and with the precipitation expected to last a bit longer, coupled with very high humidity that would have made it difficult to dry the track, track officials canceled the remainder of the program after four features had been run. The Street Stocks, Mod Minis and Figure-8 cars would fall victim to the wet stuff, though. As stated previously, four classes did get to complete their feature events and four drivers who either had not won in their class this year or had not won in awhile took home the checkered flag. The Legend Cars saw just two of the cars out of the potent SAR Racing team at the track, one for last week’s winner Kyle Pitts while the other, the #5A car normally driven by new daddy Michael Cherry, was assigned to Bobby Diestler for the night. Veteran driver Mike Verhaagh, who comes up from Ft. Myers to race here, had his new car running strong and won the heat race, coming out on top of a great four-way battle. Verhaagh had the pole for the feature but Diestler was on the outside pole and quickly jumped to the point with Verhaagh settling into second. 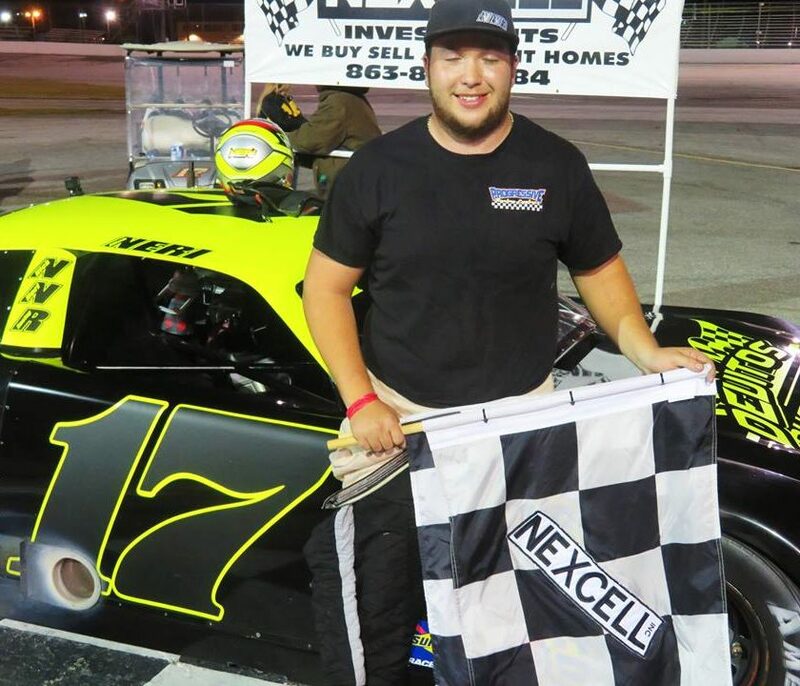 As Diestler sped away from the field, Verhaagh was doing all he could to hold onto second before Pitts slipped under him on lap 14.
starts) and just his second overall victory at Auburndale Speedway. Pitts raced home second with Mike Verhaagh getting his first podium finish of the year in third. Point leader Alan Hiefnar was fourth trailed by Mike Verhaagh’s brother Mitch Verhaagh in fifth. Rounding out the finishers were Dave Fusco, Blake Boyette (in Travis Guard’s #31) and Cale Nolen. The Mini Stocks had a very interesting night to say the least. 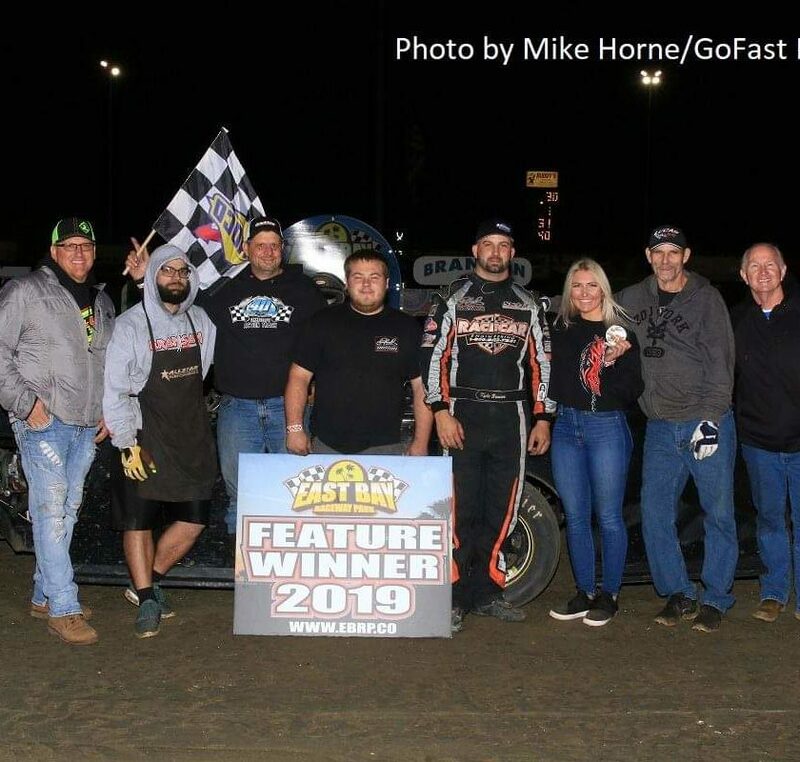 During the heat race, the fuel pump broke on point leader Chris Narramore’s machine and he thought his evening might be over as John Cummins, Jr. raced to the eight-lap heat win. Chuck Frazier offered his ride to Narramore for the feature but several drivers and crew members went to work and replaced the fuel pump on Narramore’s car to get him out in time for the 20-lap feature run. out there in the feature as he bolted out front and looked like he had a chance of taking home his first win. However, the engine of his machine was not in tune with Gatlin’s heavy right foot and it expired in a plume of smoke going into turn one just after Gatlin had taken the crossed flags for half way bringing out the caution. Bruce Cozad took over for three laps only to see the caution fly again for a turn three tangle involving Danny Leet and Fred Martin. There was some “bumping and grinding” following the restart and Cozad slowed with a flat tire to keep the caution out. 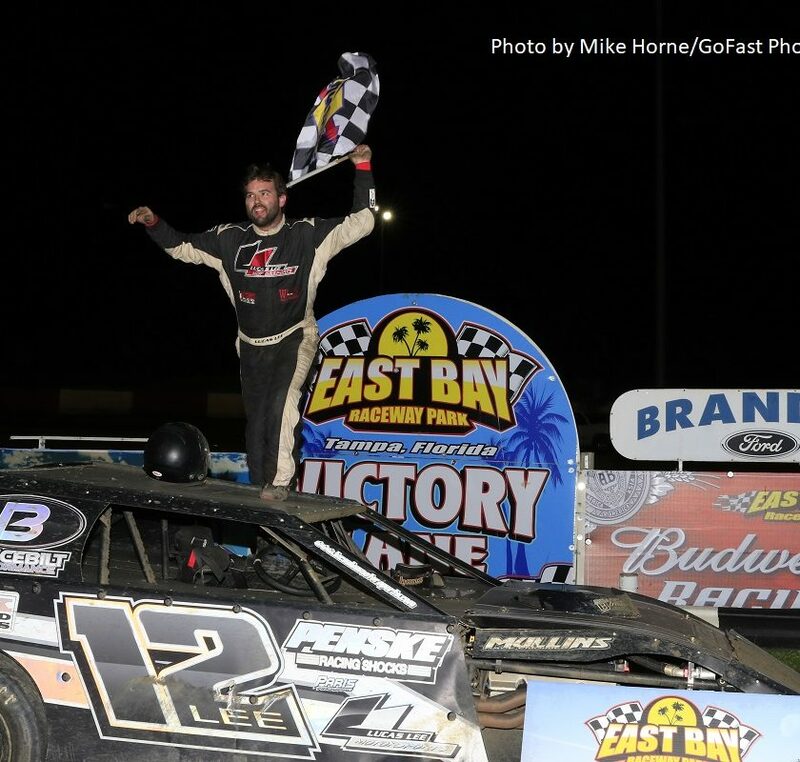 After pitting for a “new shoe” Cozad returned to the rear of the line-up as Chuck Frazier took over the top spot. Despite heavy pressure late from Narramore, Frazier held on to claim his first Mini Stock win of the year. Narramore and Colt Cecil were close behind in second and third while Cummins took the checker in fourth ahead of Cozad, Leet, Martin and Gatlin. Clay Samuels found victory lane for the first time in quite some time in the Mini Cup feature race that ran green to checker. Heat race winner Douglas Herrin, Jr. was second ahead of Bill Rychel. The Scramblers were on track when the rain began to fall but their race did run eight laps before the red flag came out. The field was actually under yellow at the time after Andy Travis and point leader Dustin Wilson had tangled in turn three. Before that, William Kerns and Keith Cantrill had been putting on a great side-by-side show for the lead. Kerns was leading at the completion of lap eight and thus was declared the winner, his first in quite some time. Heat race winner Cantrill was second followed by Bubba Healey, Wilson and Travis. Although the Street Stocks and Mod Minis saw their feature races called due to the rain, they did get their respective heat races in with Steven O’Steen taking the checker first in the Street Stock heat while Kenny Nurse, Jr.
topped the Mod Mini heat race. Auburndale Speedway will now be closed for Stock Car racing until September 9th. Many big events are scheduled for the fall racing season and the new Fellows Trucking Kids Club will debut on September 23rd.